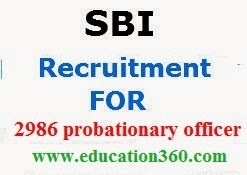 SBI Recruitment 2014-15 for 2986 Probationary Officer Posts. State Bank of India Recruitment for 2986 Probationary Officer Posts. SBI has been released a notification for 2986 jobs or vacancies. Interested and eligible candidates can apply online from 1st September 2014 to 18th September 2014. Please read the below provided information such as educational qualification, application fees, selection procedure etc. carefully before applying for this job. Graduation in any discipline from a recognised University or any equivalent qualification recognised as such by the Central Government. Candidate having integrated dual degree (IDD) certificate should ensure that the date of passing the IDD is on or before the eligiblity date. 21 to 30 Years as on 01-09-2014, i.e Candidates must have been born not earlier than 02-09-1984 and not later than 01-09-1993 (both days inclusive). Age relaxation will be applicable as per the rules. Fee payment will have to be made online through payment gateway available thereat. The payment can be made by using debit card/ credit card/ Internet Banking by providing information as asked on the screen. Transaction charges for online payment, if any, will be borne by the candidates.On successful completion of the transaction, e-receipt will be generated, take print out of it. After submission of online application form take printout of the system generated fee payment challan immediately. Fee will be accepted from 2nd working day after registration and can be made within three working days at any branch of State Bank of India. On payment of the requisite fee through computer generated challan form, registration of the online application will be complete. Candidates will be selected based on their performance in Objective Test, Descriptive Test, Group Discussion and interview. Before applying online candidates first scan their photograph and signature. Visit Bank’s website www.statebankofindia.com or www.sbi.co.in and open the appropriate Online Application Format, available in the ‘Careers with us’. Fill the application carefully with all the details. Once the application is filled in completely, candidate should submit the data. When the data is saved, a provisional registration number and password will be generated by the system and displayed on the screen. Candidate should note down the registration number and password. Candidates can re-open the saved data using registration number and password and edit the particulars, if needed. After submission of online application form, proceed to Fee Payment. Pay the fee online by using credit card/ Debit card or can pay offline method through printed challan form. On sucessful completion of fee payment process, registration of the online application will be complete. After completion of registration process, take print out of the application form and fee receipt/ e-receipt should be retained with the candidate for future reference.